Today I show you how to make Gluten Free Vegan Koftas that taste great. If you are gluten intolerant, then this is a simple recipe that will bring koftas back into your life. Great with salad, or wrapped in a tortilla, or drowned in some gravy with mashed potatoes… YUM! Add the mashed sweet potato, beans and a small amount of the vegetable stock and mix together using your hands. Only add extra stock if you need it to combine the mixture a bit more. (See the video above for a demonstration). 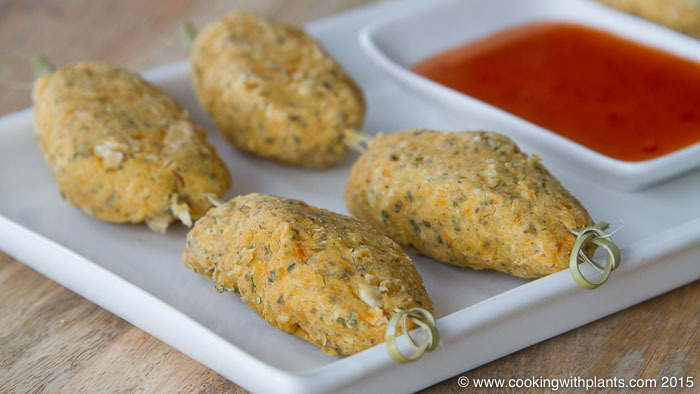 Shape into koftas and place on a baking tray lined with non-stick parchment paper. Cover with foil (or use a lid if you have one for your baking dish) and bake for 30 minutes. Thankyou Anja , loving the gluten and nut free recipes . Just reading your recipes and have noticed you have changed your measures to 0.5 i am guessing this means half. Just find this a little bit confusing and my son who is learning cooking also finds this a strange way to put 1/2 or 1/4 . just thought i would mention this . I really love your recipes by the way. They are in my cookbook Vegan Made Easy. Hi Anya. My kids and I love your videos. When you say 1/2 a cup, is that a metric cup? We live in the USA. Thanks. Yes, metric. There is a conversion button on the site but it has been a bit problematic. The cups I use are a 250ml size. I made these and they are very dense and rubbery…I followed the recipe exactly and used the correct measures, what did I do wrong? Also in the video you mention herbs but there are not in the recipe above. Fantastic 🙂 Glad you like the recipe.